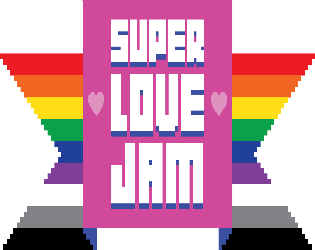 In honor of the upcoming Pride Week, Brooklyn Gamery is bringing back the Super Love Jam! The previous Super Love Jam was incredible and we're excited to host it again. Games are at a cultural tipping point. The lack of gender representation and variety when it comes to sexual expression in games and the media at large is a serious problem. In order to encourage the game industry to continue evolving and creating games about diverse topics, we're holding the Super Love Jam, a 48-hour game jam about sexual identity, gender norms, and the relationships that we form based on our identities. This game jam is open to people of all genders, races, and sexual orientations. We want this to be a safe space to express yourself. Please let us know if there's anything we can do to make you feel comfortable attending this game jam. A completely normal experience of using a bathroom, that everyone can relate to! Love is limitless, even for clouds. Work and love one another to keep the heart beating.